LEXAN™ FR25A film is a part of a product line of opaque polycarbonate films produced by SABIC. LEXAN FR25A is available in four different colors and six different gauges with a velvet finish on one side and a polish finish on the other. Standard available colors include black, white, light grey, and dark grey. The specific FR25A part number tested was White 8087 in 0.43mm gauge. LEXAN FR25A consists of a 430µm thick polycarbonate film. A diagram depicting LEXAN FR25A is shown in Figure 1. Figure 1. LEXAN FR25A diagram showing polycarbonate film (430µm). LEXAN FR25A is utilized in electronics in three-dimensional flexible circuit applications as a heat/dielectric insulator, for EMI shielding, and as a replacement for flame retardant polypropylene (FRPP). Some applications include printed circuit board insulation, backlit aircraft in-flight panels and displays, business equipment insulation, computer rack partitions, and TV and monitor insulation. FR25A is 10 times more puncture resistant than FRPP, has sufficient fold endurance, high glass transition temperature, and excellent stable dielectric strength. The non-contact nature of laser processing allows applications to be processed with small features and fine geometry which might be difficult to achieve with traditional mechanical methods. 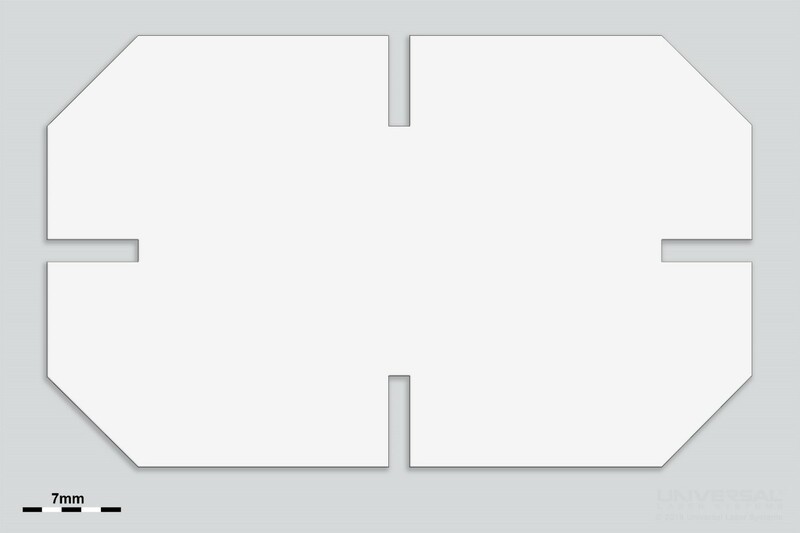 LEXAN FR25A is suitable for laser cutting; however other laser processes are not suggested as they are not conducive to the intended uses of this material. Universal Laser Systems makes it simple to consistently and repeatedly process this material to a high degree of dimensional accuracy because since the non-contact nature of laser processing eliminates material deformation during processing. LEXAN FR25A was tested to assess laser cutting compatibility and determine the best configuration of laser peak power and wavelength. The polycarbonate film LEXAN FR25A appears to absorb both the 9.3µm and 10.6µm laser wavelengths efficiently with slight differences in processing results. A microscopy image taken at 300x magnification of the edge of LEXAN FR25A is shown in Figure 2. 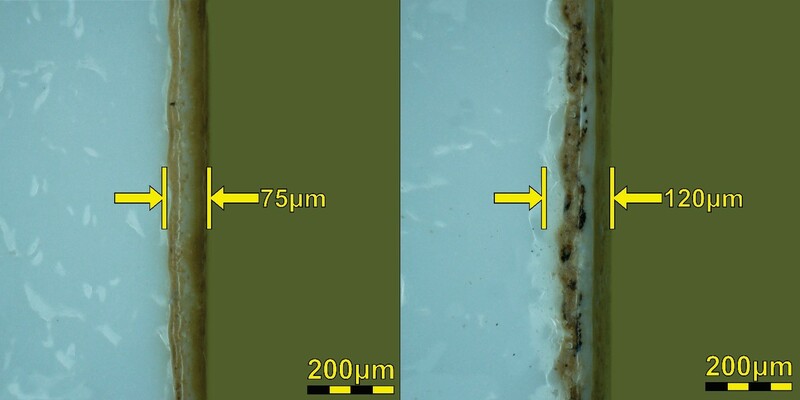 The 3D image in Figure 3 depicts how polycarbonate film responds to laser cutting with the recommended system configuration of a single 75 watt 9.3µm laser. Figure 2. Microscopy image (300x) of the edge after laser cutting LEXAN FR25A. The heat-affected zone measures 75µm. Figure 3. 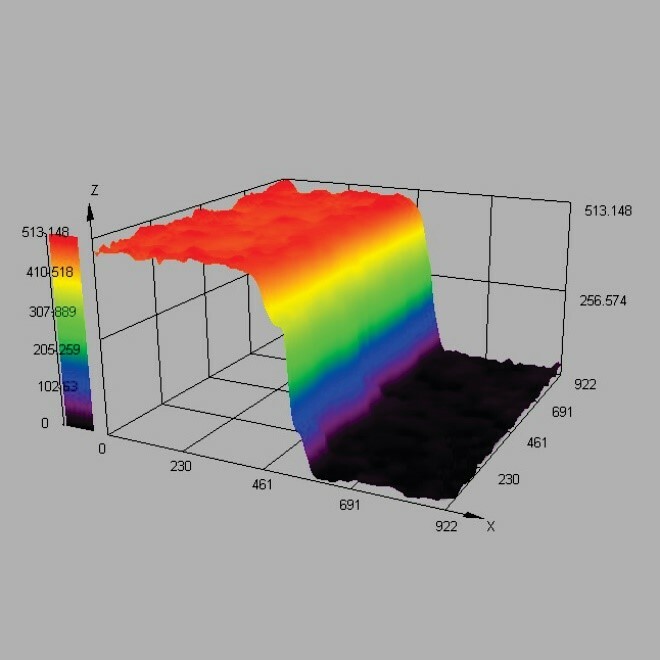 3D rendered microscopy image (300x) of the laser cut edge of the LEXAN FR25A. 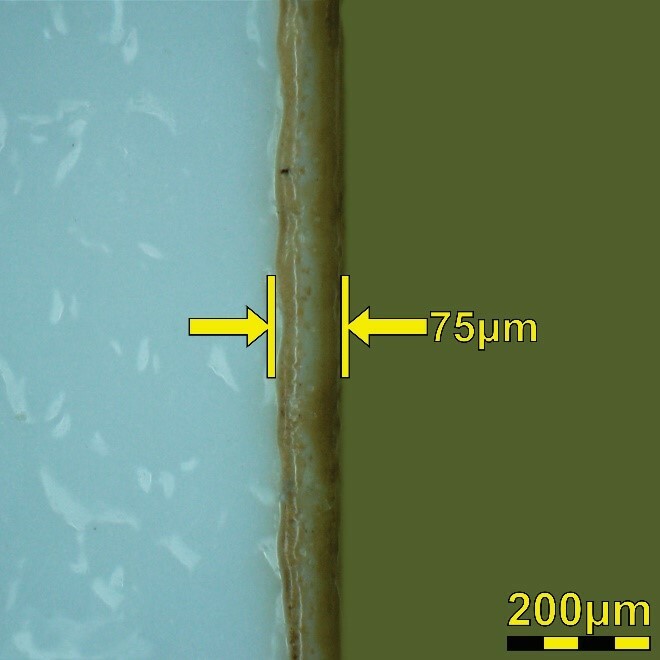 LEXAN FR25A weave was tested with both 9.3µm and 10.6µm laser wavelengths. The results of these tests were compared by analyzing the heat effects, quality of the processed edge, and post-processing requirements. The comparison of these two system configurations is listed in tabular form in Table 1 and shown photographically in Figure 4. The 9.3µm configuration produces a noticeably better edge when cutting this material and is the recommended configuration. Figure 4. Microscopy images (300x) of the processed edge resulting from the 9.3µm (left) and 10.6µm (right) wavelengths. LEXAN FR25A applications requiring fine geometry and intricate detail without degrading the physical properties of the material can be accomplished with Universal Laser Systems technology. An example demonstrating the results of laser cutting LEXAN FR25A using the recommended system configuration is shown in Figure 5. Figure 5. Example of the geometry possible with laser cutting of LEXAN FR25A. LEXAN FR25A is suitable for laser cutting and was extensively tested to determine the optimal processing configuration. Through this testing it was determined that laser cutting is viable with this material and a 75 watt 9.3µm CO2 laser source is the recommended configuration. LEXAN FR25A efficiently absorbs the 9.3 µm wavelength laser energy to produce a processed edge that has minimal heat-affected zone and discoloration.